George Nicolas Papanicolaou was born on May 13, 1883 in Kymi, Greece. His father, Nicolas, was a well-respected physician and his mother, Maria, was a very cultured lady who had a great love for Greek classical music and literature. George had three siblings, Athanase, Maria and Helen. When George was four years old he began grammar school. He was a sensitive child and spent his free time hiking in the mountains, boating or walking along the sea. When George was eleven he went to Athens to study at a school his older brother attended. In 1898, George entered the University of Athens where he majored in humanities and music. His father wanted him to become a physician. Due to his father's encouragement, George went to medical school and graduated with an "A" average in 1904. He served as an assistant surgeon in the military until 1906. Although his father tried to encourage him to remain in the military as a physician, George wanted to pursue a career in scientific research. Dr. George Papanicolaou began his medical career taking care of patients at a leper colony north of his hometown of Kymi. Papanicolaou was very sympathetic to the lepers, who received little care from the surrounding community, and spent a lot of time tending to their medical and other personal needs. In 1907, Papanicolaou went to Jena, Germany for postgraduate study at the Zoological Institute in Munich, the greatest zoological research center in the world at that time. His first teacher at the Institute in Munich was Professor Ernst Haeckel, one of Europe's greatest early proponents of Darwinism. In 1910, Papanicolaou obtained his Ph.D., he was now George Nicolas Papanicolaou, M.D., Ph.D. After receiving his Ph.D., he married Mary Mavroyeni, the daughter of a wealthy merchant from his hometown of Kymi. In 1912, Dr. Papanicolaou joined the Balkan Alliance in the war against Turkey. He was 1st Lieutenant in the Medical Corps. During his time in the military, he had met some Greek-American soldiers who told him of the opportunities in the United States. Dr. Papanicolaou obtained a position as assistant in the Department of Anatomy at New York's Cornell Medical School in 1914. His wife, Mary, also worked there as his technician. 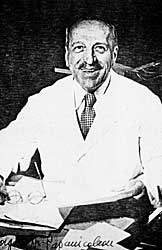 In 1920, Dr. Papanicolaou began his study of the vaginal cytology of the human. After becoming familiar with normal cytology changes- the wife Maria contributed to scientific knowledge by " volunteering " for cervical smears on a daily! basis- he found some cases of malignancy. About this discovery, he remarked, "The first observation of cancer cells in a smear of the uterine cervix was one of the most thrilling experiences of my scientific career." In 1928 he published a paper about the results of his work, entitled, "New Cancer Diagnosis." A newspaper article in the "New York World" stated, "Although Dr. Papanicoloau is not willing to predict how useful the new diagnostic method will be in the actual treatment of malignancy itself, it seems probable that it will prove valuable in determining cancer in the early stages of its growth when it can be more easily fought and treated. There is even hope that pre-cancerous conditions may be detected and checked." In 1928, Dr. Papanicolaou became a citizen of the United States and was promoted to Assistant Professor of Anatomy at Cornell. In 1939, the reevaluation of the vaginal smear for cancer detection began. At the New York Hospital all women patients were required to take a routine vaginal smear. 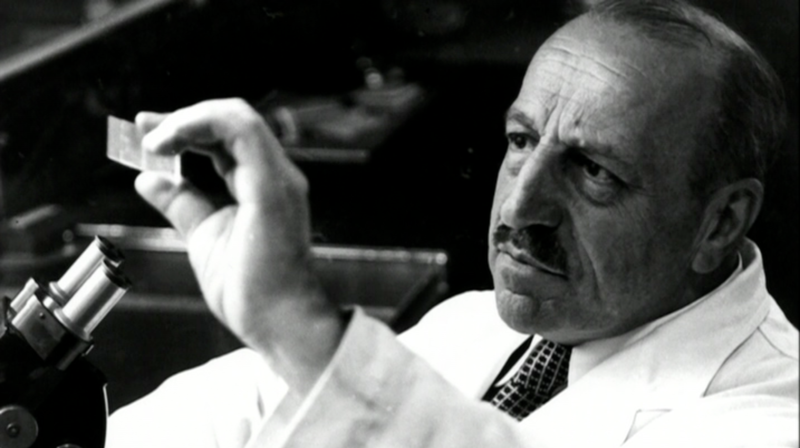 Dr. Herbert Traut, a gynecological pathologist, collaborated with Dr. Papanicolaou to validate the diagnostic potential of the vaginal smear. In 1943, they published their findings and conclusions in the famous monograph, "Diagnosis of Uterine Cancer by the Vaginal Smear." The diagnostic procedure was named the Pap test. In 1954, Dr. Papanicolaou's comprehensive scientific treatise was published. It was entitled, "Atlas of Exfoliative Cytology," which contained a compendium of cytological findings in health and disease involving multiple organ systems of the human body. Some of the many awards and honors he received were the First Award of the Order of AHEPA, as the Most Outstanding American Scientist of Greek Descent; The Honor Medal of the American Cancer Society; The Modern Medicine Award for Distinguished Achievement; Honorary Member of the Obstetrical and Gynecological Society of Athens; Honorary Member of the New York Academy of Sciences; Permanent Honorary Consultant to the Society of Pelvic Surgeons; and Honorary Degrees from the University of Athens, University of Turin and the Hahnemann Medical College. Dr. Papanicolaou died on February 18, 1962 of heart failure and pulmonary edema and is buried in New Jersey. Millions of women have received the Pap test and deaths from cancer of uterus has been greatly reduced because of the test. On May 13, 1962, the Papanicolaou Cancer Research Institute in Miami, Florida was dedicated. The dedication address was given by Dr. Papanicolou's friend, Dr. Charles Cameron, who said: "He was a giver of life; he is in the company of the great; he is one of the elect of the men of earth who stand for all eternity like solitary towers along the way to human betterment. We are deeply in his debt."